I’ll be the first to admit it: At one point in my life (read: college) drinking beer dyed green on St. Patrick’s Day felt like my genetic right as a Midwesterner with an Irish surname. And to be sure, every year there are probably millions of people eating and drinking green food and beverages to celebrate the day. 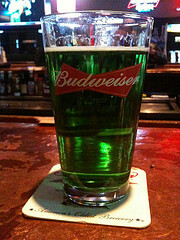 But green food has another meaning for the Irish, one that makes the American dyeing tradition kind of… sad. To be sure, there are plenty of other St. Patrick’s Day shenanigans we Americans enjoy that elicit an exasperated, if not defeated sigh from anyone actually hailing from the Emerald Isle. Like say, depositing the contents of one’s stomach on a busy city street corner in the middle of the day while a parade goes by. But NPR’s The Salt blog points to the dark past of green food in Ireland as an even more unsettling example of how some of us just don’t get it over here. As a historian explains, the Irish potato famine of the 1840s, which killed at least a million Irish in six years, pushed starving people to the edge. She adds that the happy green tint we add to our cookies, cakes and drinks might seem to conjure the rolling green hills of Eire, it can still seem odd to actual Irish people. Previous Why Is Anyone Buying The 10-Pack Of Fruit Snacks At Target?